President Recep Tayyip Erdoğan claimed yet another victory in the country's political history with his re-election in Sunday's presidential elections, with 52.6 percent of the votes. For the next five years he will serve as Turkey's 13th president of the Republic. "The people have given us the executive and legislative duties," Erdoğan said, speaking at a press conference late yesterday in Istanbul, and expressed his gratitude for the people's support. "Turkey, with nearly 90 percent participation rate, has taught a lesson of democracy," Erdoğan said. He added that the Western countries, which have lower participation rates, should change their stance against Turkey's democracy. The president said his government will continue to take Turkey to new levels of economic and social development in the new term. 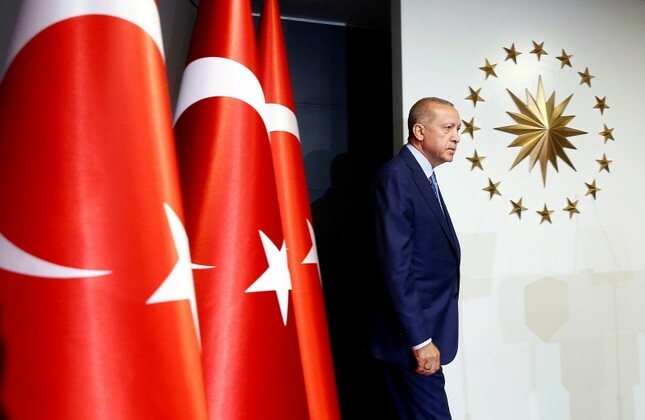 "It is time to leave behind the campaign period rivalry," Erdoğan said, and added that Turkey will transition into the new presidential system in a speedy manner. Erdoğan ran for president against five other rivals as the joint candidate of the People's Alliance, formed by his Justice and Development Party (AK Party) and the Nationalist Movement Party (MHP). According to unofficial results, the incumbent president came out as the winner in two of the three most-populated provinces, Istanbul and Ankara, while his rival the main opposition Republican People's Party (CHP) candidate Muharrem İnce, received the majority of votes in İzmir. İnce received 30.8 of the overall votes in the polls at the time Daily Sabah went to print [97 percent of the ballot boxes opened], an increase from his party's traditional numbers in the country, which lie between 20 and 25 percent. Aside from İnce, the newly established Good Party (İP) Chairwoman Meral Akşener, the Peoples' Democratic Party (HDP) former co-Chair Selahattin Demirtaş, the Felicity Party (SP) Chairman Temel Karamollaoğlu and the Patriotic Party (VP) Chairman Doğu Perinçek also ran as presidential hopefuls. Following Erdoğan and İnce, Demirtaş received 8.1 percent, while Akşener receieved 7.4 percent of the votes. The SP and VP candidates received 0.9 and 0.2 percent respectively. Erdoğan won the support of the majority in 64 provinces, while his closest rival, İnce, claimed victory in eight provinces, and HDP candidate Demirtaş came out as the winner in nine provinces, all of which are in the eastern and southeast of the country. The incumbent president saw an increase in support in Istanbul and Ankara, two provinces where Erdoğan had not received a majority in the April 16, 2017 referendum on the constitutional amendments. İnce was able to secure the majority on the west coast of the country, where his party has traditionally had majority support, with the exception of the eastern Tunceli province, another CHP stronghold. In 2014, Turkey had, for the first time, elected its president through popular voting. Then, three candidates had competed: Erdoğan, Demirtaş, and the joint candidate of the CHP and MHP Ekmeledding İhsanoğlu. Erdoğan was elected with 51.8 percent as Turkey's first president elected with a popular vote, followed by İhsanoğlu at 38.4 percent and Demirtaş at 9.8 percent. The victor Erdoğan had received more than 21 million of votes, while İhsanoğlu had received 15.58 million and Demirtaş received 3.95 million of votes. In the three most populated provinces of Turkey, Istanbul, Ankara and İzmir, Erdoğan had come as the winner of the most votes in Istanbul and Ankara, while İhsanoğlu had claimed the majority of the votes in the CHP stronghold western province of İzmir. While Erdoğan claimed the majority of the votes in central and northern provinces, the CHP candidate had received the majority of the votes in the western and southwestern coastal provinces. Demirtaş had claimed majority of the votes in the eastern and southeastern province, which are mostly Kurdish-populated, followed by Erdoğan. The participation rate in 2014 presidential elections was nearly 74 percent. As of today, the government system of the country, which was been at work since the formation of the Republic of Turkey in 1923, will begin to change from the parliamentary system to the presidential executive system. The constitutional changes necessary to switch the government from a parliamentary to a presidential system were approved by the public in last year's referendum on April 16. The most prominent change is that the government will now be headed by a president, rather a prime minister, as the post is now dismantled. In a sign of more streamlined governance, the number of ministers, who will be appointed by the president, will decrease from 21 to 16. The ministries will not be removed rather they will be combined, with the Foreign Ministry and European Union Ministry united under a single portfolio. The same is true for the Customs and Trade Ministry and Economy Ministry, the Ministry of Labor and Social Security, the Ministry of Family and Social Policies, the Ministry of Food, Agriculture and Livestock, the Ministry of Forestry and Water Affairs, the Ministry of Development, and the Ministry of Science, Industry, and Technology. With the new system, several organizations will now be organized as agencies, affiliated with the presidency, including the National Intelligence Agency (MİT), the Turkish Armed Forces General Staff, the Presidency of Defense Industry, the National Security Council, the Presidency of Strategy and Budget, the Presidency of Religious Affairs, the State Inspection Council and the Presidency of Communications. A separate hierarchy of agencies under the presidency will now run the government. A new presidential administrative office will be founded to run the daily routine of the presidency. Four new offices are also being established to introduce a faster and more strategic decision-making process in governance. Offices on human resources, finance, investment and digital transformation will be established to supervise the state's human resources and institute the state's digital transformation to adapt to the digital age and fight cyberterrorism. Nine separate councils will develop, supervise and coordinate relevant policy suggestions. The main priority will be a more effectively run government by delegating responsibility with authority. One of the main focal points of the transformation of the state will be to institute a more effective economic management structure. The number of ministries linked to the running of the economy will be decreased from six and their responsibilities will be more clear-cut to better delineate their areas of influence. The many facets of counterterrorism will be channeled into a single and more organized structure for a better coordinated and more effective fight against terrorism. The incumbent president who served as prime minister between 2002 and 2014, Erdoğan became Turkey's first president who was directly elected with the votes of the electors in 2014. He was the joint candidate of the People's Alliance, which was formed by the AK Party and Nationalist Movement Party (MHP). İnce has been CHP parliamentarian four consecutive times in 2002, 2007, 2011 and 2015. He failed twice to win against CHP leader Kemal Kılıçdaroğlu for party chairmanship. Known for his fiery rhetoric and populist style, he was nominated by the CHP as a presidential candidate in early May. Demirtaş is the former co-chair of the HDP. He was a lawyer before he entered politics as a member of the Democratic Society Party (DTP) in 2007, he was elected as an independent parliamentarian from southeastern Diyarbakır province in 2007. Demirtaş is currently held in pre-trial detention for charges related to supporting PKK terrorists. Akşener was nominated by the İP, which was formed in October 2017 by herself and former dissidents of the MHP. She is currently the leader of the İP, and served as the interior minister of Turkey between November 1996 and June 1997. Karamollaoğlu has been serving as the chairman of the SP since October 2016. He served two terms as a deputy in the central Sivas province and also served as mayor of Sivas from 1989 to 1995 for the Islamic conservative Welfare Party, which was banned in 1998. Perinçek is a lawyer and current chairman of the VP. He entered politics by establishing the far-left/Maoist Revolutionary Workers' and Peasants' Party of Turkey in 1969. The VP is known for its anti-Western, neo-nationalist outlook.